35. AREVALO, J. OCHIENG, R., MOLA-YUDEGO, B. & GRITTEN, D. 2014. Understanding bioenergy conflicts: case of a jatropha project in Kenya's Tana Delta. Land Use Policy. In Press. 34. GONZÁLEZ-GARCÍA, FEIJOO G, MOREIRA M T, MOLA-YUDEGO B. 2014. Cradle-to-gate Life Cycle Assessment of forest operations in Europe. Environmental and Energy consequences. Journal of Cleaner Production. doi: 10.1016/j.jclepro.2013.11.067. In Press. 33. FERRAZ FILHO A, SCOLFORO J RS, MOLA-YUDEGO B. 2014. Coppice with standards silvicultural system applied to Eucalyptus plantations - a review. Journal of Forestry Research 25(2):237-248. 22. RÖSER D, MOLA-YUDEGO B, PRINZ R, EMER B, SIKANEN L. 2012. Chipping operations and efficiency in different operational environments. Silva Fennica. [PDF] [RG link]. 19. FABRA-CRESPO M, MOLA-YUDEGO B, GRITTEN D, ROJAS-BRIALES E. 2011. Reflecting the divergences between forest policy and public perceptions in the Region of Valencia (Eastern Spain). Forest systems. In Press. AREVALO J, HALDER P, KORTELAINEN J, MOLA-YUDEGO B. 2014. 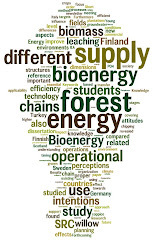 Bioenergy: From Local Conflicts to Global Governance. Oil Gas and Energy Law. 05/2014. In Press. SEBASTIÀ M.T., MOLA B., ARENAS J.M., CASALS P. 2004. Biomass responses of subalpine grasslands in the Pyrenees under warming conditions. Grassland Sciences in Europe, 9: 290-292. HALDER P, AREVALO J, PUENTES Y, MOLA-YUDEGO B. 2013. Improving forest conflict management and governance tools, based on a global to local understanding of its core issues. Ministry of Foreign Affairs of Finland. AREVALO J, GRITTEN D, MOLA B. 2008. A pioneer in the internationalization of forestry eductation. Silva Carelica 54: 152-153. In: Saastamoinen O and Tahvanainen L. 2008. Towards global education in forest sciences. Silva Carelica, 54. University of Joensuu, Faculty of Forest Sciences. ISSN: 0780-8232.